Starmobile Diamond Price is Php 9,990, Release Date Will Be in April, Features 5-Inch HD Display, Dragontrail Glass, 12 MegaPixel Camera with BSI Sensor, and 2,000 mAh Battery Pack! Last Thursday, Starmobile social media team left a curious direct message on TechPinas' Twitter account. 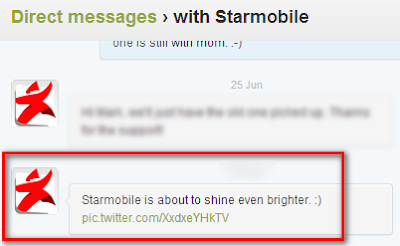 It read, "Starmobile is about to shine even brighter"
Shocked, as it was my first time to see the elegant Starmobile Diamond, I quickly sent a text message to one of our friends from the company, Paula, and asked for more information about the yet-to-be-announced handset. She didn't really disclose all that too many details about the device but I did learn that it runs Android Jelly Bean operating system with a Dual Core processor, has 1 GB of RAM, flaunts a 5-inch HD display protected by scratch-resistant Dragontrail glass, features dual cameras - a 12 MegaPixel main one with LED flash at the back and another 3 MegaPixel front-facing snapper in front both having BSI sensor for brighter and clearer images in not-so-well-lit settings, an HD recorder, and a removable 2,000 mAh Li-Ion battery pack. 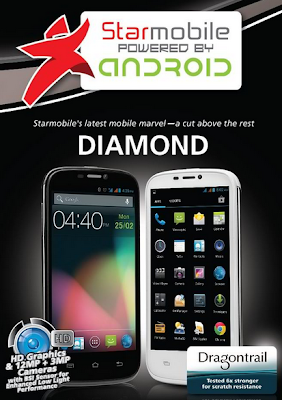 Just from looking at Starmobile Diamond's technical specifications, it's clear that it will accomplish at least two things when it hits store shelves in April. First, it will serve as a follow-up to the best-selling TechPinas Favorite Php 9,290 Starmobile Flirt, which has a smaller screen, less RAM, and a smaller battery pack. And second, it will go head-to-head with recently launched Cherry Mobile Omega HD that has almost the same technical specifications - right down to the Dragontrail glass. Excited to get your hands on Starmobile Diamond? (Don't you just love its name?! I really love it!) Well, the smartphone will become available nationwide early in April with official suggested retail price of just Php 9,990, which I think is already very sulit considering all that you're getting. I own a Starmobile Flirt and Starmobile Astra and I can really vouch for the build and quality of Starmobile handsets; They're really good.